Clearway Gritting has just celebrated 15 years of providing winter gritting maintenance so our teams know how to prepare for bad weather. Read our article to help you prepare your vehicle when snow and ice are forecast. 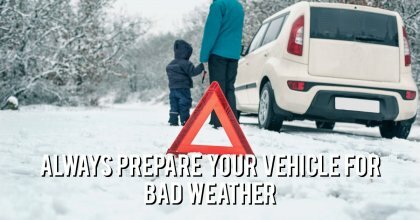 Check your car is ready for bad weather and make sure you wear warm clothes in case of a breakdown. If you make a few checks now your vehicle will be prepared for snow and ice. The RAC recommends the following winter checks. They use an acronym ‘FORCES’ so you remember what to do. If you are stuck in heavy traffic you will use more fuel. If roads are blocked because of snow and ice you might be unable to get to a local garage so make sure you always set off with plenty of fuel. Check your oil level and top-up your vehicle if required. You can find the oil cap in your car by using the oil can symbol. Remember to only put in the correct amount and don’t overfill it. Tyres with good tread and those at the recommended pressure will help you drive better in the ice and snow. You can check your tyre tread using a tyre gauge. The RAC recommends you check tyres every fortnight and use a minimum tread depth of 3mm on icy or wet roads. Coolant is a mixture of water and antifreeze and it helps keep your car engine remain cool. When your car engine is cool check the coolant level and top-up if necessary. Replace bulbs and fuses so all your lights and indicators work optimally in winter weather. According to the RAC battery problems are the main reason for call-outs in bad weather. Make sure you use proper anti-freeze screen wash as it is most effective in very cold weather and avoids the risk of your windscreen freezing up. Effective screen wash will keep your windscreen free of grit, dirt and ice caused by road gritting and salting.